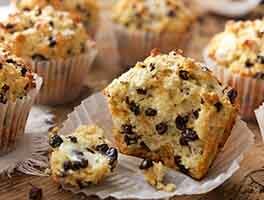 Moist, tender muffins with soft bits of fruit "jammy bits" — delightful! 43 mins. to 52 mins. Preheat oven to 400°F. 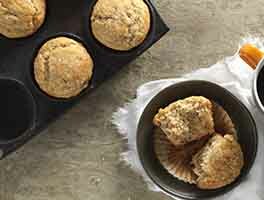 Lightly grease a 12-cup muffin tin, or line with papers. Stir together the flour, oats, sugar, baking powder, baking soda, and salt. In a separate bowl, beat together milk, oil or butter, eggs, and vanilla. Gently stir the wet ingredients into the dry ingredients, mixing just enough to blend. Stir in the Jammy Bits. Allow the batter to rest for 20 minutes, then stir. Divide it among 12 muffin cups, filling each cup about 3/4 full. Bake the muffins until golden brown and a cake tester inserted in the center comes out clean, about 20 minutes. Remove from the oven and allow the muffins to cool for 5 minutes before turning them out on a rack to finish cooling. I ordered Peach Jammy bits and tried them in this recipe and they were delicious! I did make some changes. I made 6 jumbo muffins so I baked at 375 for 22 min. I did 1 1/4 cup WW flour and 1/2 cup all purpose. I used a rounded teaspoon of vanilla paste. And I added some cake spice (cinnamon, ginger, nutmeg, allspice). Excellent! FABULOUS! 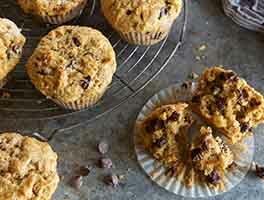 These muffins are simple to make and come out tender and tasty! 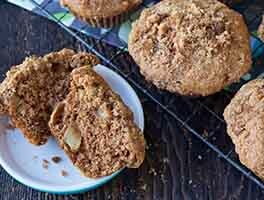 I used apple cinnamon jammy bits and we loved them so much I just ordered some other flavors. Kudos KAF, you are my favorite site for recipes and baking tips. First, when I want to bake something and don't have a recipe in mind, guess where I go ? King Arthur Flour. Your recipes have not failed me yet. I love how light and moist these were even with all whole grain ingredients! I used oil for shortening and baked them in my cast iron muffin pans. The wait time was perfect for preheating the pans with oil, which seems to be the key to baking in cast iron. My question is about the wait time. Is it because of the jammy bits? Or the recipe itself? I didn't have jammy bits so I used blueberries and they were just delicious. As a trivia question, why do you suppose my antique muffin pans have only 11 cups ?? Was 12 not always the standard? It is a griswold / wagner ware pan. The extra space was taken up by places for your fingers to grab the pan, which is nice. Plus it still works - I just have slightly taller muffins! Thanks for being such a great, friendly company, spreading good vibes all over the world! Cant have too much of that, now, can we? Really enjoyed these muffins. I used the raspberry jammy bits. 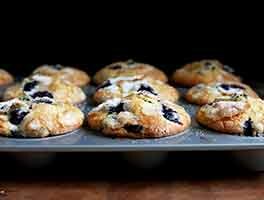 Muffins freeze nicely, too, just remove from freezer in the morning and you will have a nice treat waiting for you in your packed work lunch. :). Looking forward to trying these with the cherry jammy bits. Thanks for being such a great company and offering quality products and recipes and excellent customer service. I made these with cinnamon apple jammy bits. I have an electric convection oven, so I baked these at 375 degrees for 17 minutes. They baked perfectly, and they're not too sweet. I am a professional baker, and my advice is to use oil instead of butter for a moister muffin. Watch your baking time closely too. was a bit underwhelmed by this one. i notice other reviewers doctored up the original recipe. i missed in grape jelly instead of jammy bits, but still the result was dry and bland. I made these today very yummy!! I Only had 1/4 c raspberry bits so I mixed 1/4 c. mini chocolate chips and sprinkled sparkling sugar on top! The chocolate chips made the bits more noticeable. These are delicious! I reduced the amount of jammy bits and added some white chocolate chips instead, and they were wonderful! 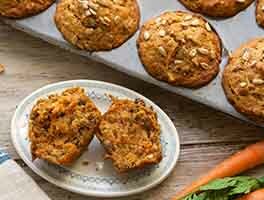 These, as several other King Arthur muffin recipes are my staples and I've made them so many times! Very easy to make. Only two changes made, used raspberry Jammie bits and added a bit of cake enhancer. They were light, moist and had a wonderful taste. Love these muffins! I make them quite frequently, sometimes using raspberry jammy bits, sometimes fresh or frozen raspberries. I have also been adding 1/8 tsp. of Fiori di Sicilia. That takes them over the top! I especially like that this recipe is 100% whole grain. No guilt! !